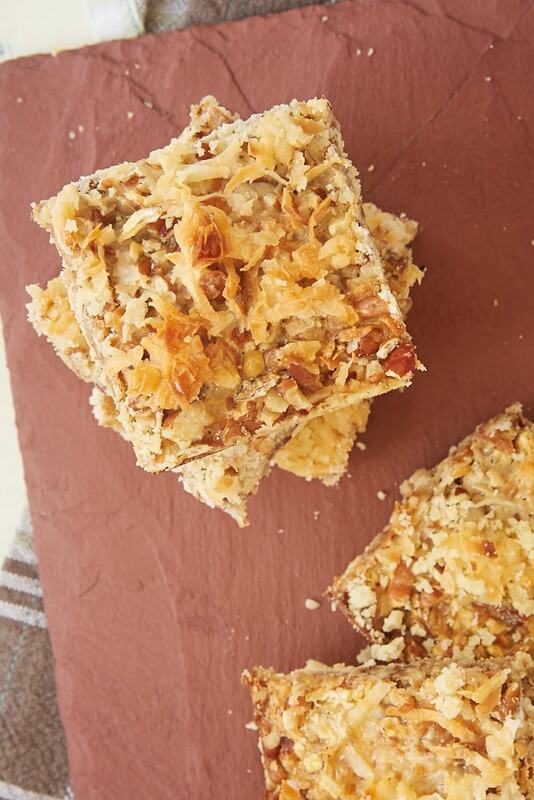 Coconut Pecan Shortbread Squares combine two great flavors in an easy to make shortbread. A homemade treat that’s made with minimal effort! You regular readers know all about Quinn’s long-standing aversion to coconut and my abiding love of it. My coconut-containing baked goods are few and far between. I have to plan it out in advance so I have someone else who will take them off my hands once I’ve had my sampling. 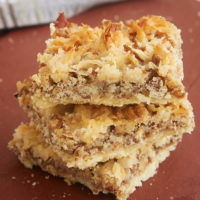 These Coconut Pecan Shortbread Squares bars feature not only coconut, but also my beloved pecan sitting atop a shortbread crust. 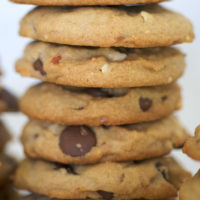 They are gooey and chewy and just plain delicious. The flavor of them reminds me a bit of that wonderful traditional frosting on German chocolate cake. The crust is a very simple combination of butter and flour. 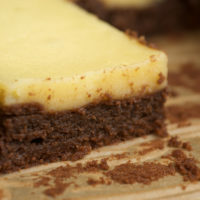 It’s understated and that works very well with the flavorful topping. The recipe is a fairly true adaptation from More From Magnolia, the follow-up to The Magnolia Bakery Cookbook. The book describes these by saying that they couldn’t be easier to make. That’s very true. Just five ingredients and very little time are required to make them. The only difficult part is waiting overnight to get to eat them. As with all shortbread recipes, be very attentive to measuring your ingredients, as the ratio is essential to getting the best result. Be sure to review my tips for measuring flour if you need a refresher on best practices. I love these bars so much, especially when I need a super quick and easy dessert. If you have a reasonably well-stocked baking pantry, you’re likely to have everything you need whenever you get a hankering for these guys. 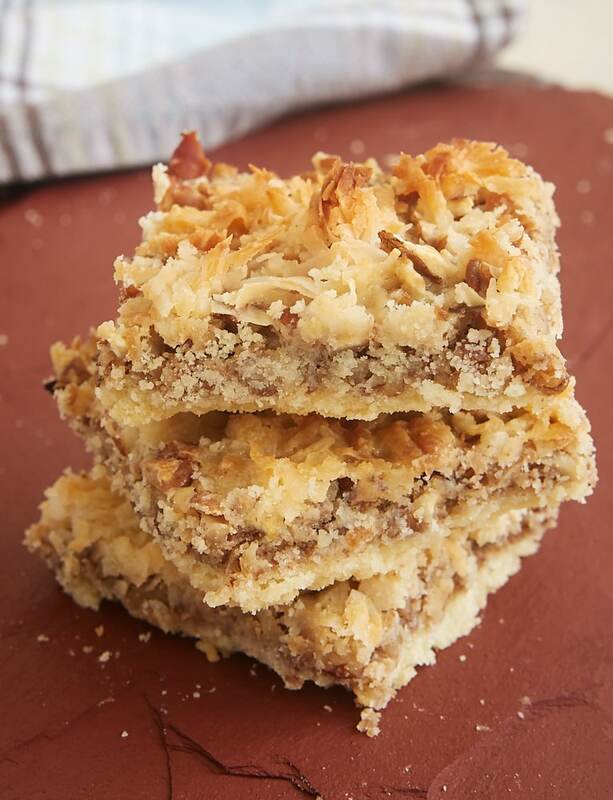 You only need 5 ingredients to make these sweet, nutty, chewy, gooey, delicious Coconut Pecan Shortbread Squares. Using an electric mixer on medium speed, beat together butter and flour until crumbly and well combined. The mixture will be crumbly but should hold together when pinched. Transfer to an ungreased 13″x 9″pan. Pat the crust mixture firmly and evenly into the pan. Bake for 15 to minutes, or until lightly browned. Remove from the oven and cool for 30 minutes. Sprinkle the pecans and then the coconut over the crust. Pour the condensed milk on top, completely covering the coconut. Bake 30-35 minutes or until lightly golden. Cool to room temperature. Cover tightly and allow to set overnight before cutting. If you like, you can add a pinch or two of salt to the crust mixture for a little salty bite. Recipe slightly adapted from More from Magnolia. This looks delicious! I might swap out the pecans for macadamias though; I have some leftover that need to be used up! ooh – you’re talking my language with these; I’m a sucker for coconut! I’ll take some of the unwanted coconut baked goods anytime! These look delicious – I’m down for anything that even resembles German chocolate cake! These look delicious and the recipe seems so simple! Well, simple except for that minor issue of letting the bars sit overnight before you cut into them… I will have a very hard time following that direction. These look amazing! The perfect treat to disgust my husband with, he hates coconut and any kind of nuts! Wow! These look really good! I love coconut! These look incredible! I love anything with coconut, and luckily, my husband does, too. Add pecans and well, these are just about perfect! Jenn, I think macadamias would be great. caked crusader, you and me both! 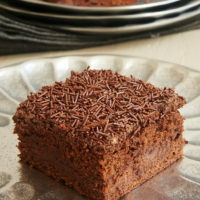 Culinarywannabe, it’s been ages since I had german chocolate cake. I so love it. Amy, I admit that I didn’t realize they had to sit overnight until I was finished. Not cool. Cant not love this, all the goodie ingredients. I always end up baking stuff like this ans eating alone as hubby cant eat anything sweet. Been wondering what happened to you! Love the coconut bars. I recently made some similar bars. I didn’t really like mine as they had a graham cracker layer on the bottom and I felt that it overbaked, but I would LOVE this shortbread crust. Thanks for the recipe! Guess I’m lucky, my husband likes coconut–at least I know he’ll eat an Almond Joy or Mounds! Ooo these look good. I love coconut anything and this sounds like such a yummy baked good! I made these once but used strawberries instead of coconut because I have, like you, a coconut-hater in the house. These look good, really good. Katrina, yours have the added benefit of having chocolate. That’s the only thing that could potentially make these better. These look fantastic! Welcome back! Do you recommend the Magnolia Bakery book? I have been considering purchasing it. Coconut is definitely hit or miss with me, but I love almond joys and these actually remind me of a treat my mom used to make for my dad called Chocolate Squares. 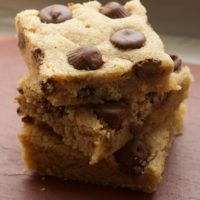 They were much more than that, a type of shortbread crust on the bottom top with sweetened condensed milk, chocolate chips and coconut. They were incredible and these sound a lot like them! MM coconut, I bet thesse are delicious. I have a similar recipe except that I have caramel added then dip the bottoms in melted chocolate and drizzle remaining chocolate on top. Sometimes I will take a short cut an sprinkle chocolate chips on the bottom of the pan before pressing in the shortbread, and some on top of the coconut. Taste similar to the GS Coconut Delites. Those looks awesome. Thanks for the recipe. Em, I really like the Magnolia Bakery cookbook. Click here and here for more things from that book. Nick, coconut is all hit with me, especially when chocolate is involved. Natalie, you should try them! hawkswench, your version sounds delicious! I like the idea of dipping the bottoms in chocolate. How can anyone not like coconut?! The entire idea makes my brain hurt. I think I need these squares to live. Yuuuuuuuuuummmmmmm. I LOVE coconut. Didn’t always though. It took some convincing. 🙂 I really really have to make these! Emily, it’s interesting that you have come to like coconut. For Quinn, he says it’s mostly the texture. Anyway, I’ll be sure to check out that lemon shortbread. Sarah, I hope you like them! I love coconut! Glad you are back with a killer recipe! Thanks! Patricia, I’m glad to be back in the kitchen! I don’t know what I did wrong but the shortbread bottom did not hold together. It was dry, powdery & just fell apart from the absolutely devine topping. I am a fairly seasoned baker so I don’t know what happened. Thanks for your sharing, I have made so many of your recipes & am always getting rave reviews. Hi, Joan. I’m sorry you had troubles! 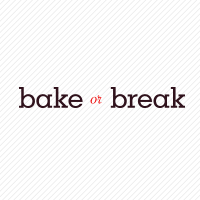 Shortbread can be temperamental. If it’s not holding together well when it’s mixed, try adding just a bit of water until it’s more cohesive. Jennifer are you sure this recipe is correct? Only saw one person who actually made it and they had problems with the crust. I want to make these for a party but I’m scared to try it. Hi, Casey. Yes, I make them exactly like the recipe. Issues can arise with this type of crust if the flour isn’t measured well. I’d suggest a quick review of my tips on how to measure flour accurately. could you use coconut flakes (unsweetened)? most sweetened coconut also contains bisulphates which can be deadly for anyone with asthma. That’s fine, Susan. They’ll just be a little less sweet. Jennifer, I just recently found your recipe site and was delighted with the Strawberry White Chocolate Oatmeal cookies I baked. 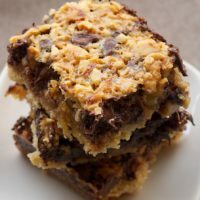 I want to try these pecan bars but need to know how well they freeze. My husband doesn’t like coconut. Sad but true.